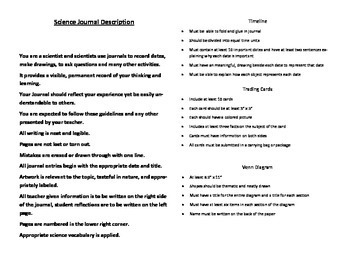 This is a 15 page science journal guide set up to create a booklet that glues to the inside front cover of the students science journal. 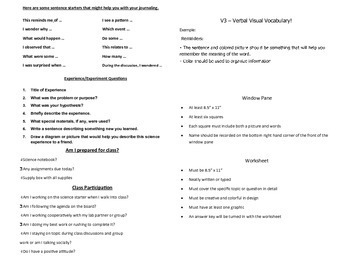 It provides sentence stems, experience/experiment questions, class expectations, science journal description, science safety contract, Important information about science class expectations. 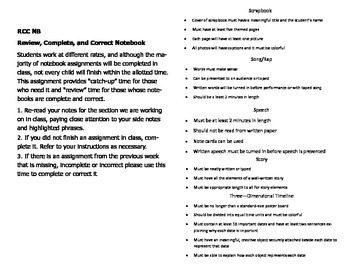 It also includes instruction on how to create all the different project that may be assigned throughout the year. This will serve as a reference guide throughout the year for students as they complete projects. While is is designed for 4th - 8th grade will minor modifications it can be used with any gradelevel.